There have been several Manor houses on the site in St. Martins since circa 1254, indeed the present Manor is being managed by direct descendants of the first de Sausmarez Seigneurs. Fragments of the 13th century building can still be seen, as can the original Seignorial Court House which in the Queen Anne period had a smoke house built above it; moreover, Sausmarez Manor has Norman, Tudor, Queen Anne, Regency and Victorian architectural elements which form a continuous historic record of the fortunes of the family and the island of Guernsey. 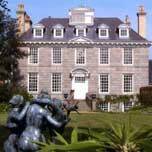 The façade we see today was built in 1714 at the request of Sir Edmund Andros, Seigneur de Sausmarez, Lt. Governor and Bailiff of the island. Sir Edmund was also Governor of nine of the original states of America including New Jersey and New York, indeed the façade is regarded as the finest example of Queen Anne colonial architecture in the British Isles. Over the years the income derived from the diminished estate has declined to the point that it is no longer able to restore and then maintain this architecturally important building. In particular, the Tudor barn needs rebuilding, which is infested with Death Watch Beetle. Furthermore, works of art and artefacts need constant preservation. Much of the money needed in the past was raised by sale of property, land, paintings, opening the house to the public, leasing sites to other attractions, hiring out the house and grounds. The ancient seigniorial dues known as Congee which made a significant contribution to the income of the estate were annexed by the States in 1980 who now receive the £250,000 each year. The estate has shrunk not only as the result of the sales mentioned above, but also through the generosity of the family to the island. For example, land at Jerbourg – including the pine forest, together with land else-where for Polish refugee houses, has been given, while paintings have been given or loaned to Candie Museum, Castle Cornet and Government House. In addition, 80,000 16th and 17th century documents were lent to the States; 17th century knitwear to Candie Museum, and £6,000 given in the early 19th century to build St. James. More recently, £10,000 was given to help restore St James which was in dire need of major repairs. At present, the house and grounds are lent to other charities for fund raising and celebrations. Europe where a variety of grants are available for listed buildings of this quality. It is left up to the Friends to act positively by raising money through voluntary subscriptions and recruiting both amateur and professional volunteers to help restore the building and its contents. By popular and independent demand, a Sausmarez Manor Heritage Society has been formed, the members of which are known as Friends of the Manor. All money that is raised will go into an independent charitable trust formed at the request of the States of Guernsey and will be administered by the Trustees solely for the maintenance of the Manor estate and the administration of the Friends. Members are entitled to free access to the house, when it is open, the Sub tropical Garden, Pitch & Putt and Sculpture Park once a year. Members will also recieve newsletters and a membership card. Information will also be given concerning exhibitions, functions and events organised by the Friends.